Financial abuse or exploitation of older adults has been called the crime of the 21st century. While the extent of the problem is not fully known, a recent survey commissioned by Vancity Credit Union entitled “The Invisible Crime” suggests almost half of seniors in Vancouver and Victoria have been a victim of financial abuse. While only 6.4% of respondents self-reported being victims of financial abuse, when presented with a list of scenarios, 41% of seniors in the Lower Mainland and Victoria regions have experienced at least one situation that can be classified as financial abuse. 7.1 % had someone use their credit or debit card without their permission. 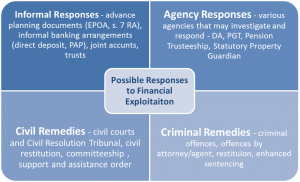 The availability of restitution as a civil remedy; the absence of a presumption of advancement; and the existence of the presumption of a resulting trust has greatly simplified civil recovery work in the field of the financial abuse of older adults. Financial exploitation or financial elder abuse is the misuse, misappropriation, and/or exploitation of an older adult’s funds and assets without that person’s knowledge and/or full consent, or in the case of an older adult who is not mentally capable, not in that person’s best interests; or the misuse of an Enduring Power of Attorney. Overcharging for services or products, overdue bills. Many of these family loans are undocumented, and the borrower may later claim it was a ‘gift.’ However the law has a ‘legal presumption’ that these types of advancements from an older adult to an adult child are considered a loan rather than a gift [see Pecore v. Pecore,  1 SCR 795, 2007 SCC 17], unless the adult child can show proof otherwise (e.g. – money was in a birthday card). For advancements to a minor child (under 19 yrs.) the presumption is reversed, it is presumed to be a gift unless it can be shown to be a loan [e.g. – I.O.U, promissory note, loan document). (b) in which no time for payment has been expressed. Many family loans are likely (b) – no mention is made about how or when they should be paid back. In the case of demand loans, ‘discovery’ is on the first day of default after a demand for repayment has been made and no payment is made. [section 14 of the Limitation Act]. Note that there are two parts to this ‘discovery’ – a demand is made, and the person who borrowed the money does not comply. From the date the payment was demanded and not paid, the clock starts to run for the two year limitation period. So this can be quite a while after the loan was made. The law recognizes for a lot of people who aren’t used to lending and collecting on loans, a two year period from the date an undocumented loan was first made is too short a time to be fair. Powers of attorney can be seen as part of the solution for an older adult who is unable to manage their funds, but they can also be part of the problem. The most common form of financial elder abuse is a ‘rogue’ power of attorney – POA’s have been called “a license to steal.” The attorney can literally bankrupt the older adult. There are some obvious responses to financial abuse and the older adult is capable – for a rogue power of attorney, the power of attorney can be revoked (see Nidus material Procedures to Revoke (Cancel) an Enduring Power of Attorney which includes a form of a Notice of Revocation), and another attorney appointed in their place. The Public Guardian and Trustee can investigate allegations of financial abuse. Civil and criminal remedies are available. See generally the CLE-BC Practice Point paper Dealing With The Rogue Attorney by Kimberly-Anne Kuntz of Bull Housser & Tupper LLP, Vancouver, BC. An older adult may set up a joint bank account with a relative or friend to help with banking chores and paying bills. But this may create another “a license to steal” – each signer on the account is entitled to 100% of the money at any time. The Pecore case tells us again there is a legal presumption is that when an older adult puts an adult child on a joint bank account for convenience, there is a ‘resulting trust’ and the child is a ‘trustee’ for the older adult’s money and not entitled to it themselves. When the older adult dies, the money would be part of the estate, rather than automatically going to the adult child. This may be the case even if it is a joint account with ‘right of survivorship’ – it is not necessarily automatically the property of the surviving account holder. Prudent practice suggests if an older adult does intend to gift the joint account a ‘deed of gift‘ should be used. On the other hand, to make clear no gift of the account proceeds is intended, a bare trust document should be executed. Older adults will often put another on title of a car or real property such as their home. Often this is set out as a ‘joint tenancy’ however if the title document does not specify, the presumption in BC is that real property ownership is tenancy-in-common, while for personal property the presumption is as joint tenants. There are numerous concerns with joint tenancy ownership. Judgments or the bankruptcy of the other owner are a concern. The other joint tenant can unilaterally sever the joint tenancy (a break in one of the four unities.) While there may be an apparent joint tenancy, has the beneficial ownership been given? Is the right of survivorship and independent property right, post Pecore? Older adults will often put another on title when that person is expected to be their caregiver in exchange either for the right to live there, or to inherit the property when the older adult passes. We recommend a private care agreement in these circumstances. Here at Seniors First BC we are often contacted by one adult child of an older adult, concerned that a brother or sister is financially abusing their parent(s). On further investigation, and with confirmation that the older adult is capable, it often turns out that this ‘abuse’ has been a long standing form of financial assistance for a child who is unable to manage on their own due to some disability. We explain that the older adult is free to do with their money as they wish. It may be that the adult child calling is more concerned about the ‘best interest of their inheritance’ rather than the best interest of the parent(s). Or it may be a long standing resentment – a ‘mom always liked you best’ situation. Reports of financial abuse by a sibling need to be looked at carefully before rushing to judgment. Lawyers may be familiar with the equitable concept of undue influence in the area of wills drafting. Undue influence can be used to set aside a transaction that cannot be said to be freely or sufficiently consented to. Undue influence may be “actual,” or intentional, where one person intentionally manipulates or pressures another person for the purpose of obtaining that person’s agreement. Undue influence may also be exercised unintentionally, where influence arises by nature of the relationship itself. A relationship of dependence may develop between an older parent and adult child for example, in which the parent relies on the child for emotional support and practical assistance. In this context, the parent may agree to transactions because of a fear that doing otherwise might jeopardise this crucial relationship. The adult child may be completely blameless, with no intention of withdrawing support or otherwise punishing the parent who does not go along; the parent’s experience of influence, and not the intentions of the child, establish undue influence for the purposes of the doctrine. Lawyers, especially older lawyers, may be less familiar with restitution as a civil remedy. The Supreme Court of Canada has recognized restitution as an independent source of civil obligation, resting on the principle of avoidance of unjust enrichment. It has been said to be the third main area of civil law, after contracts and torts, and to cover cases of unjust enrichment not adequately dealt with by these two mainstays of civil law. that there is no good reason in law (‘juridical reason’) for the defendant to retain that benefit. See also the CLE BC publication Experience Hendrix, Please! Lesser Known Restitutionary Remedies Revisited. If the financial abuse is ongoing or imminent, it may make sense to contact the police to intervene to prevent any theft or misappropriation of funds. One may face an obstacle when doing this – the police often suggest that this is a ‘civil matter’ or ‘family matter’ rather than a police matter. It is important to be adamant that this is a crime, that the police need to intervene to prevent a further crime from happening. – will this include ‘right of survivorship’ or just to help out? – agencies/institutions could include churches and seniors centres – main one in Vancouver is ‘The Bloom Group’ (formerly with St. James Anglican Church). NOTE- other process is court application for private Committeeship – w/ 2 Dr’s affidavits. includes strata disputes and small claims up to $5000. – connect people to community, social, health, justice and government resources, including counselling resources. – info on the justice system, relevant federal and provincial legislation and programs, resources as needed. identifies some of the issues which can arise when an attorney misuses the authority granted by a power of attorney. A review of various options including informal options, personal planning documents (EPOA; RA7); other legal options (Pension Trustee, Committee of Estate); and, about responding to concerns about abuse, neglect or self-neglect (role of DAs, PGT). A table setting out various options including informal options, personal planning documents (EPOA; RA7); DAs; TSDMs; other legal options (Pension Trustee, Committee of Estate + Person); statutory guardianship, and, mental health committal. An info sheet for when an adult in residential care is no longer able to manage their affairs, or a substitute decision maker is abusing or mismanaging the adult’s finances. 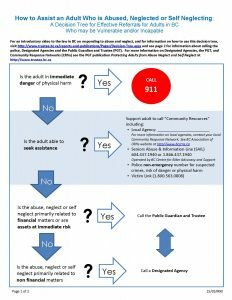 besides a useful flowchart or ‘decision tree’ for making effective referral to adults who may be vulnerable and/or incapable and being abused, financially exploited, neglected or self-neglecting, this tool include a link to a video on the relevant law, and a chart with information about calling the police, designated agencies and the PGT. Commitment on POAs and JDAs – the Canadian Bankers Association has made a ‘voluntary’ commitment to the Federal Government [before they were forced by regulation] to educate their staff and their customers on the uses and possible risks of powers of attorney and joint bank accounts.